It probably has to do with restaurants too. 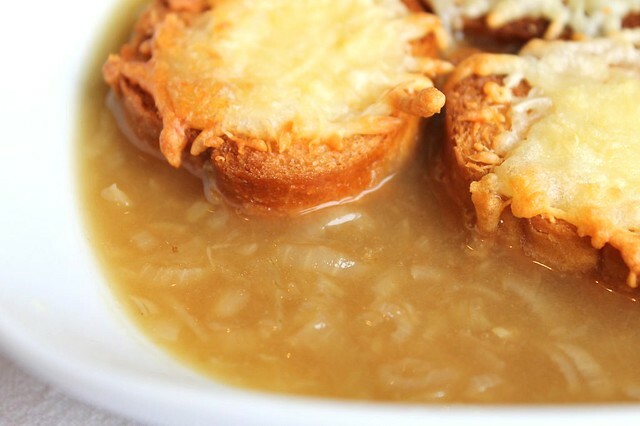 Funny fact but I didn't have the onion soup in France. Not even once, though I lived there for some 8 months. It would be interesting to find out which region of France it is more common for, because around Paris it doesn't seem to be too popular. In Moscow the best one I had was at Creperie de Paris. It had that deep brown color and flavor, which makes the soup so unique and so easily distinguishable. Now once I cooked it I got clear it is coming directly from those many cooking hours. Not 1, 2 or 3 but 5 hours for the broth, and it is same with cooking the onions. It is like the bouillabaisse - with the slow cooking time the flavor changes substantially and there is no shortcut way to achieve the same. E.g. 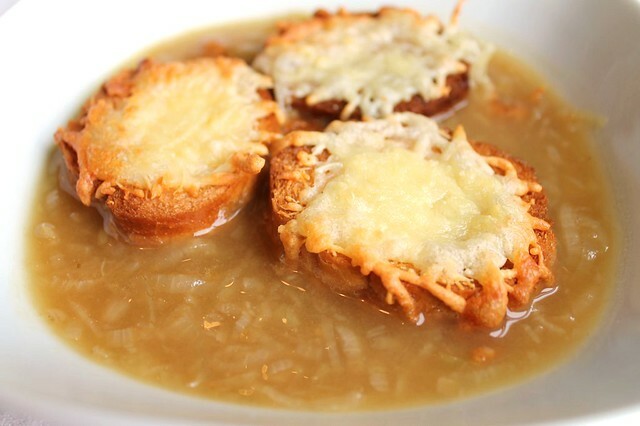 the onion soup I had in Moscow at Простые вещи restaurant tasted nicely, but it was not even close to that depth of flavor. Простые вещи I love for other reasons though. To add to that, I have to say it is more about time than complexity. How hard can it be to make the stock, sauté some onions and so forth? So it is quite a nice stand by job for a day when you are at home, doing some other things. And everything aside, how often do you by 3 kilos of beef scraps and bones? That was worth doing just to look into my butcher's eyes after. I enjoyed the whole journey a lot, but I'm not insisting. If you decide not to embark, at least I hope you will enjoy my pictures. Julia Child's recipe felt like the right one to start with, so that's what I did. On my way I also discovered a beautiful Stephen Cooks healthy food blog, who also uses her recipe. I'm living in a country where there is no ready made beef stock which would be good enough for this soup. If you are in a similar situation, it perhaps makes sense to make a lot of stock at once and freeze what you are not using immediately. But if you have some available around you, you have an option of skipping the fun with 3 kg of bones and 5 hours of cooking. Melt the butter in oil in a heavy base saucepan. Set the pan over low heat, add the onions, cover with a lit and cook for 15 minutes. Take the lid off, add 1 tea spoon of salt and sugar, raise heat to medium and cook 30 - 40 minutes. Stir frequently and scrap the bottom to stop the onions sticking and burning. The onions should turn golden brown. Sprinkle in the flour and cook stirring for 3 minutes. Remove from heat. Pour in a bit of stock and stir well. Add the rest of the stock and wine, season with salt to taste and bring to a boil, stirring. Simmer partially covered 30 - 40 minutes, removing the scum from time to time. Take off the heat and taste for salt. To make the croutons, brush the baguette slices with a bit of olive oil from both sides. Place them on a baking sheet covered with foil and bake for 15 minutes at 180C. Take out, sprinkle with cheese and return to the oven (as close to the upper grill as possible) for around 5 minutes (till the cheese is melted and crispy on the sides). Pour the boiling hot soup into the serving bowls and, place 3 croutons into each bowl. Serve immediately. Place the meat, carrots and onions into a large roasting tray and roast at 200C for 30-40 minutes, turning from time to time. Transfer to a large saucepan. Make sure all the juices from the tray get into the saucepan (use hot water from a kettle to deglaze the tray. Add the rest of the ingredients into the saucepan and cover with water. Bring to a boil and simmer partially covered 5 hours, removing scum occasionally and adding more water if necessary. Strain through a fine sieve or cheesecloth and degrease before using. The easiest way to degrease is to refrigerate the stock before straining (the fat gets firm and filters out). If you don't have time for that, you can use paper towel to remove the fat from the top of hot stock. Dip it in just slightly, so that it soaks up the fat. You can make the stock long in advance store it frozen in plastic bags. Цветопередача фотках в этот раз замечательная! Thank you! Do you know how the veg version is made? it would need to be some very special veg stock... would be interesting for me too!